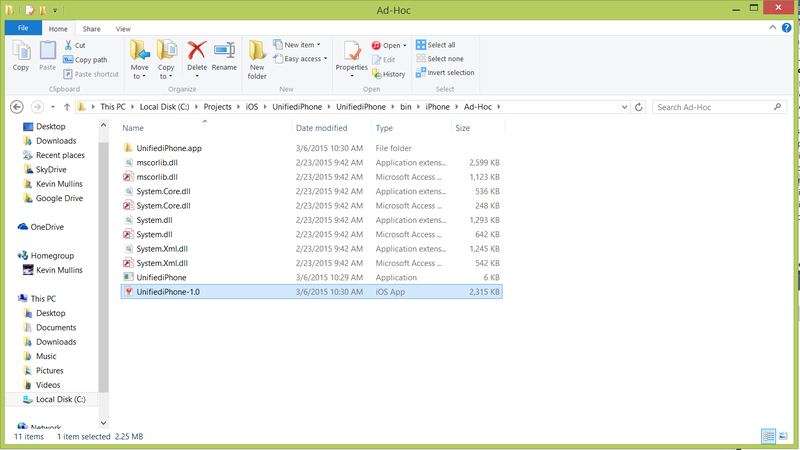 This article covers how to create an IPA file that can be used to deploy an application using Ad Hoc distribution, either for testing, or for In-House distribution of internal applications. Ad Hoc Testing — An iOS application can be deployed to up to 100 users (identified by specific iOS device UUIDs) for Alpha and Beta testing purposes. 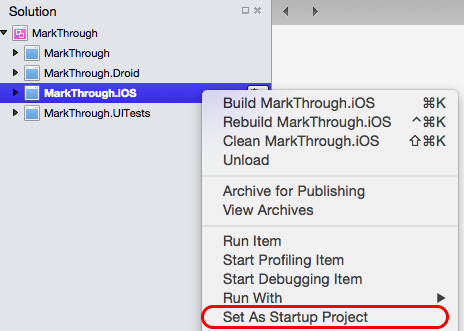 See our Provisioning an iOS Device for Development documentation for detailed information on adding test iOS devices to your Apple developer account, and the Ad-Hoc guide, for more information on how to distribute in this way. In House / Enterprise Deployment — An iOS application can be deployed internally, within a company, which requires membership of Apple's Developer Enterprise program. More information on In House Distribution is detailed in the In House Distribution guide. 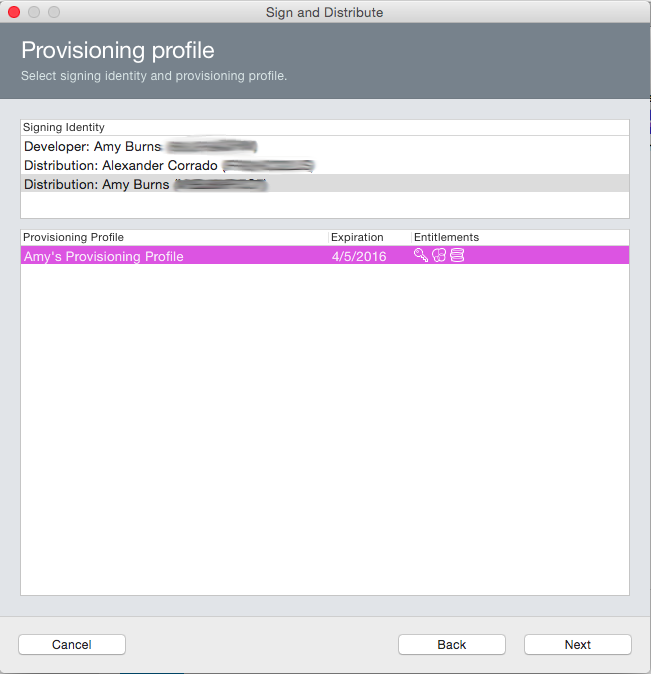 In either case, an IPA package (a special type of zip file) must be created and digitally signed with the correct Distribution Provisioning Profile. 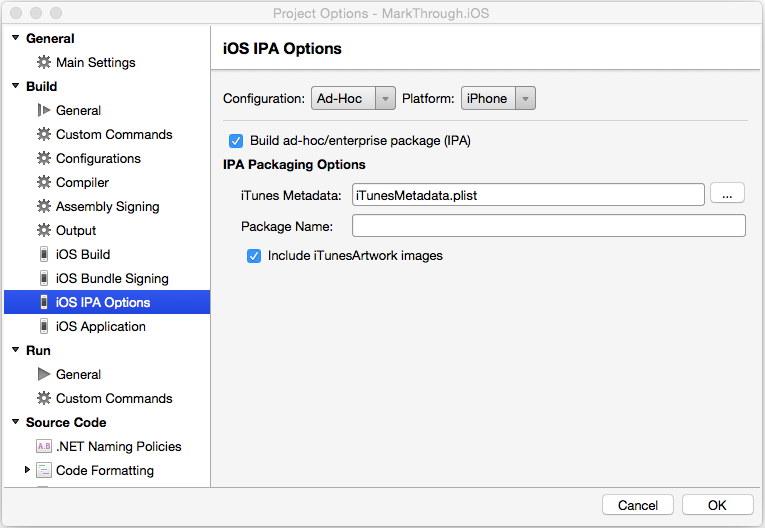 This article covers the steps required to build the IPA package and install the package on an iOS device using iTunes on a Mac or Windows PC. 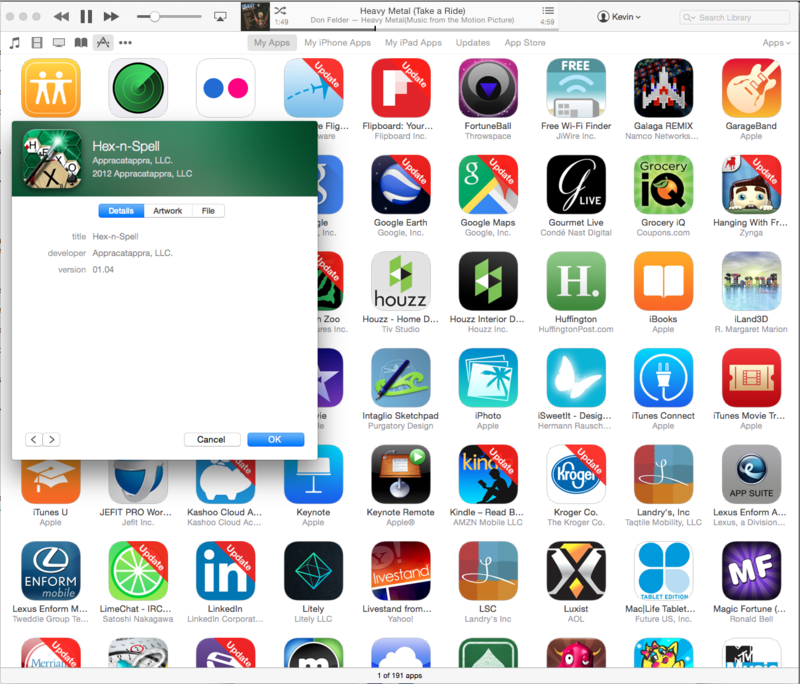 When an iOS application is created in iTunes Connect (either for sale or free release from the iTunes App Store), the developer can specify information such as the application's genre, sub genre, copyright notice, supported iOS devices and required device capabilities. iOS applications that are delivered either via Ad Hoc or In-House distribution, need to have some way to support this information so that it can be visible on iTunes and the user's device. By default, a small iTunesMetadata.plist file is created every time you build your project and is stored in the project directory. 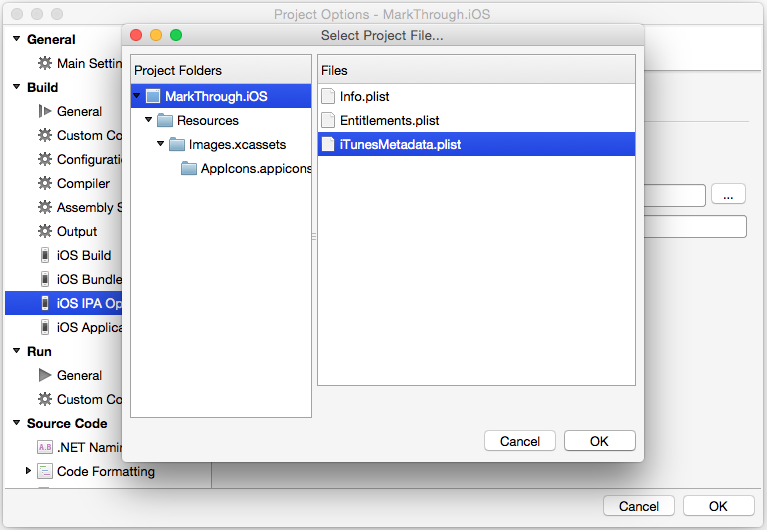 A custom iTunesMetadata.plist can also be created to supply the additional information to a distribution. To find out more about the content of this file and how to create it, please see our The iTunesMetadata.plist Contents and Creating an iTunesMetadata.plist File documentation. When delivering your app through non-App Store means, you also need to include a 512x512 and a 1024x1024 image that will be used to represent your application in iTunes. 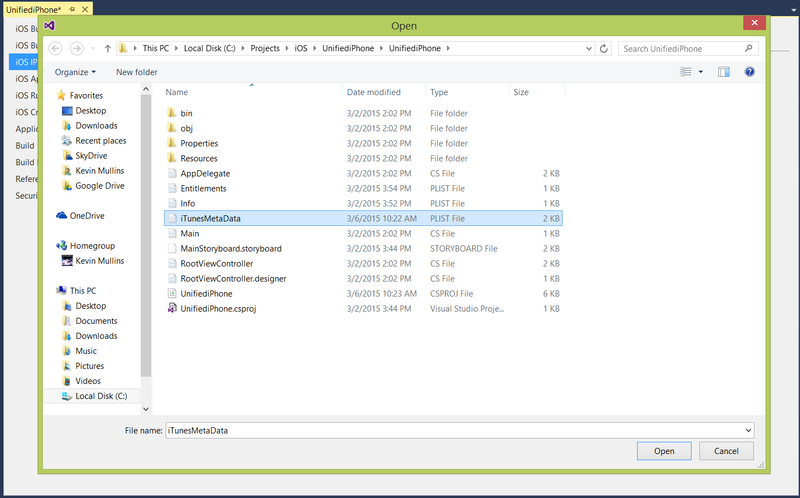 Double-click the Info.plist file in the Solution Explorer to open it for editing. Scroll to the iTunes Artwork section of the editor. For any missing image, click on the thumbnail in the editor, select the image file for the desired iTunes artwork from the Open File dialog box and click the OK or Open button. Repeat this step until all needed images have been specified for your application. Please see the iTunes Artwork documentation for more details. 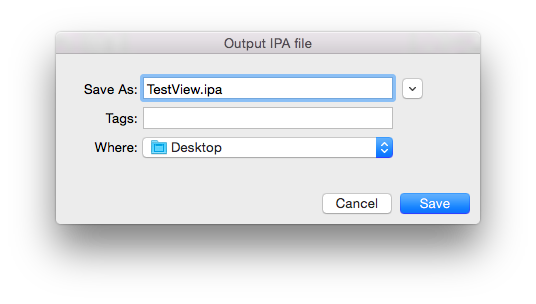 Creating an IPA is now built into the new publishing workflow. To do this, follow the instructions below to archive your app, sign it, and save your IPA. To build an IPA, an archive of a release build of our application needs to be created. This Archive contains our app and identifying information about it. 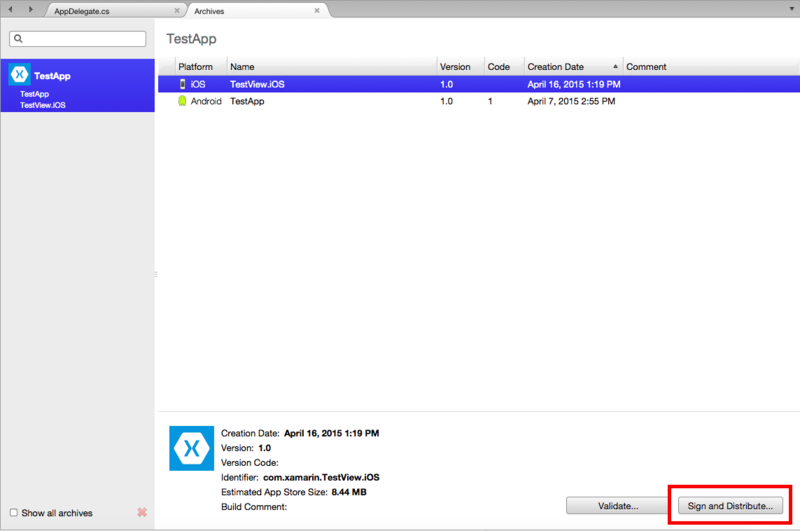 Select the Release | Device configuration in Visual Studio for Mac: ! Each time you build your application for Archive, it will automatically open the Archives View, displaying all archived projects; grouped by solution. By default, this view only shows the current, open solution. To see all solutions that have archives, click on the Show all archives option. It is recommended that archives deployed to customers (either Ad-Hoc or In-House deployments) be kept, so that any debug information that is generated can be symbolized at a later date. Note that for non-App Store builds the iTunesMetadata.plist file, and iTunes artwork set will automatically be included in your IPA if they are found in the archive. 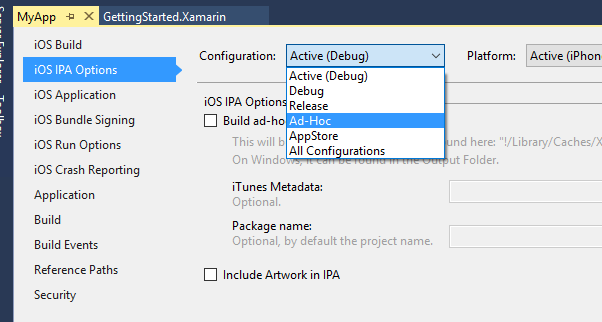 An Ad-Hoc configuration may not be available for newer Xamarin.iOS projects. If it's not available, select the Release configuration. You can optionally specify a Package Name for the IPA, if not specified it will have the same name as the Xamarin.iOS project. 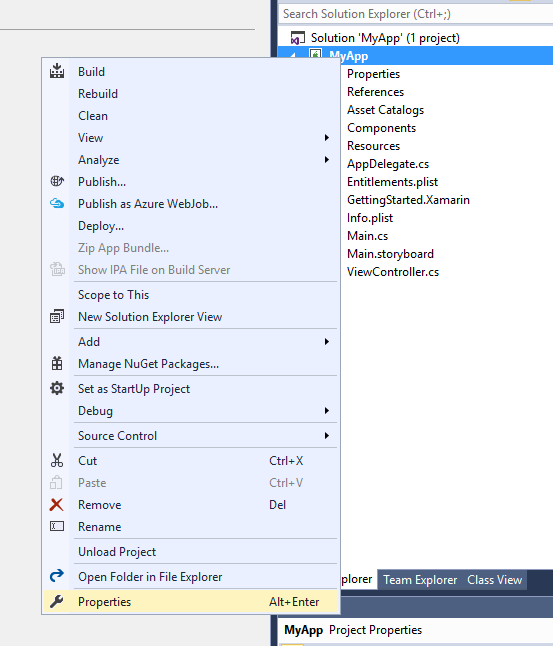 Save your changes to the Project Properties. Build the project to create the IPA package. A new MSBuild property IpaPackageDir has been added to make it easy to customize the .ipa file output location. If IpaPackageDir is set to a custom location, the .ipa file will be placed in that location instead of the default timestamped subdirectory. This can be useful when creating automated builds that rely on a specific directory path to work correctly, such as those used for Continuous Integration (CI) builds. An alternate technique for msbuild or xbuild command-line builds is to add a /p: argument to set the IpaPackageDir property. In this case note that msbuild does not expand $() expressions passed in on the command line, so it is not possible to use the $(OutputPath) syntax. You must instead provide a full path name. Mono's xbuild command does expand $() expressions, but it is still preferable to use a full path name because xbuild has been deprecated in favor of the cross-platform version of msbuild. The resulting IPA Package can be delivered to your test users for installing on their iOS devices or shipped for Enterprise deployment. No matter which method is chosen, the end user will install the package in their iTunes application on their Mac or Windows PC by double-clicking the IPA file (or dragging it onto the open iTunes window). 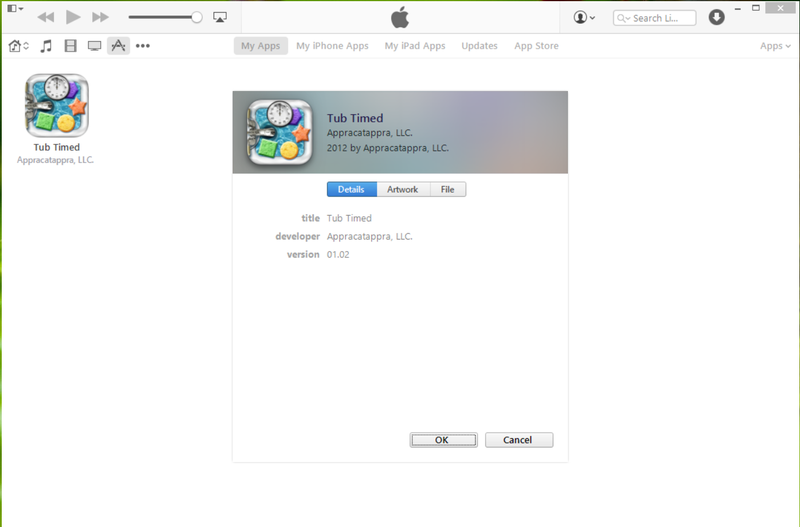 The user can now sync iTunes with their device to install the new iOS application. 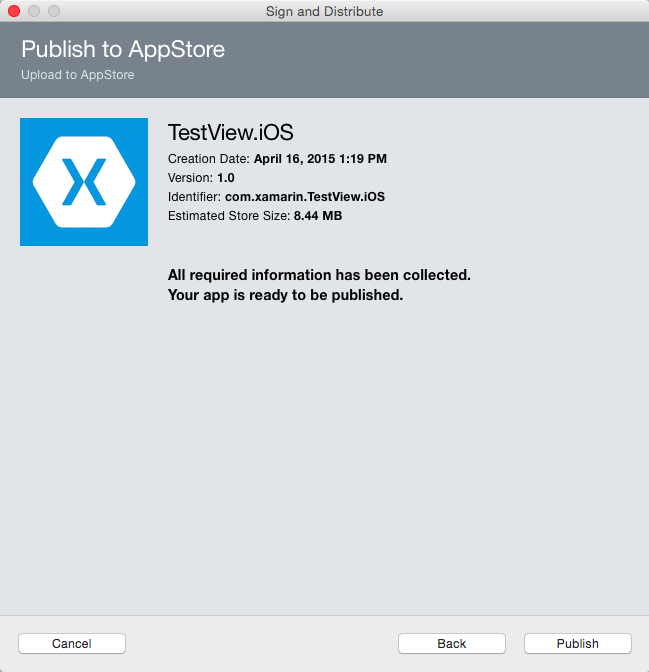 This article covered the setup required to prepare a Xamarin.iOS application for a non-App Store build. 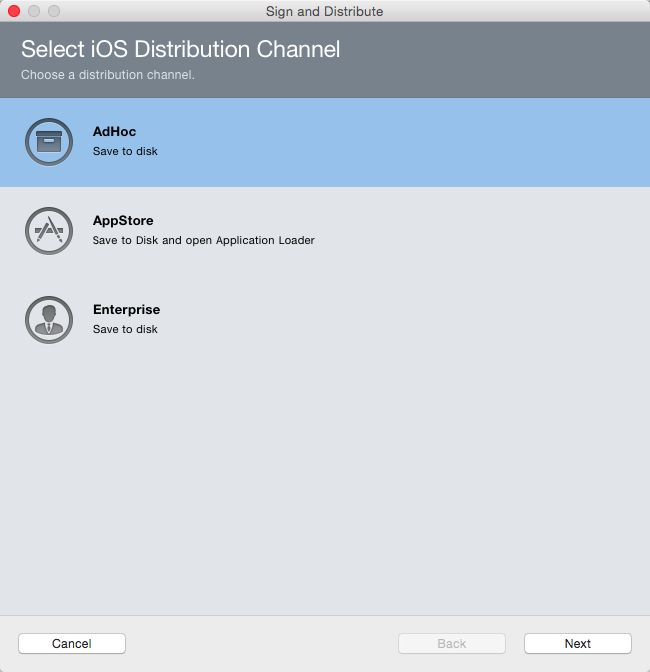 It showed how to create an IPA Package and has how to install the resulting iOS application on the end user's iOS device for testing or In-House Distribution.